We ship parts out each weekday (except holidays). Some USPS First Class shipments occur on weekends. Parts can be expected to ship the same day or the next business day (unless you order something that we've indicated as a special order). We'll contact you if your shipment gets delayed for any reason. 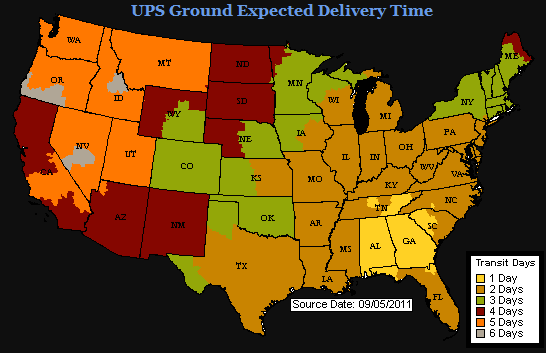 You'll get an email when your order has shipped, and a tracking number if it shipped via UPS Ground. Once you have placed parts in your shopping cart, you will be able to obtain the shipping cost. Our site only accepts orders that are shipping to an address inside the contiguous U.S. states (as well as some orders to Alaska, Hawaii, & U.S. territories, depending on order contents). We can make exceptions to accommodate HI, AK, & military APO/FPO/AE addresses. You may email us here with your shopping cart & the destination postal code for a shipping quote. We want to help avert returns by helping you order the right part. If you need help diagnosing if you need a certain part, just ask us for help. A conversation can go a long way in avoiding problems. If you order a part that was correctly labeled online & never install it but find that you won't be needing it, return it with a copy of our receipt within a month for a 90% refund (less shipping). Used parts can be returned (subject to the 10% restocking fee) within 30 days, regardless of whether they've been installed. If you receive the wrong part due to either an inaccurate listing, incorrect VIN matching, or a mis-shipment, call or email us & we'll gladly work with you to get it right or get your money back.